Grades: 202, 304, 304L, 316, 316L. 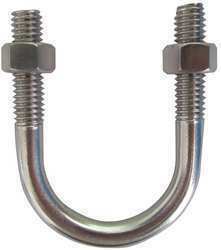 Types of U-Bolts:- U-Clamps, C-Clamps, D-Clamps. Also available as per your specific requirements. Established, incorporated and started its operation in the year 2012, we, Popular Steel & Engineering Co., is one of the leading manufacturers, suppliers, traders and exporters of a wide range of the premium and high grade of Stainless Steel Tubes, Sheets, Fittings and Allied Products. The product range offered by us is inclusive of Stainless Steel Tubes, Sheets and Rods Bars & Wires. Owing to their durability, resistance against corrosion, ability to tolerate high temperature, seamless finish, wear & tear proof construction and high tensile strength, these stainless steel products are highly appreciated among our customers. We have set up a huge infrastructural facility that is known for its large and standardized production capacity. The quality assured stainless steel and ultra-modern machinery are used for the purpose of the manufacturing/fabricating the offered steel products as per the industry set norms, quality and standards. We offer these stainless steel products in different designs and sizes, keeping the convenience of our customers in mind.